本論文隨着宋代旅游文化發達，士大夫文人經驗了更多的旅游, 旅游以後,以詞表達了自己旅游的經驗與感受. 于此宋詞出現了多種旅游空間、新來的空間認識. 本文要將詞的旅游空間以山水空間與都市空間分劃, 加以硏究.第一, 山水空間方面, 詞人除了客觀山水描寫以外, 在主觀的審美意識的視覺下, 寫出了山水空間與空間認識. 旣有在詞的上片描寫了山水空間, 在詞的下片寫出了自己感懷. 也有在詞的下片描寫了山水遊覽客的情況. 第二, 都市空間方面, 詞人描寫了地域都市風光以後, 通過回想行爲, 表達了在那箇城市經驗的內容. 還有樓亭空間是宋代新的旅游資源, 詞人旅游了各城市所在的有名樓亭建築, 然後爲了文人交遊, 在那樓亭開了宴會. 宋代沒有旅游時間的限制, 花市, 燈市等的夜市至于通曉. 柳永的元宵詞以遊覽客爲主, 得到了戱劇的特性. When viewed on the basis of the discussions so far, we are able to assign value as myth text on the culture critic text (The XXth Century) of Eileen Chang that awaken the religious life (‘daily life’). Thus the value of the cultural text is the result found in the fact that provide some sort of clue to the modern man fell into crisis, with the hope that daily life and current organized by the Eileen Chang can wake up the consciousness of the masses. In particular, exposure to faithfulness in respect of prototype of real life, which has been existed in the life of Chinese, are available to answer the questions about why Eileen Changgranted the privilege to the routine. It refers to the currency andmodernity formed in an unique philosophical grounds of Eileen Chang. Thus this paper finds the motivation of the Eileen Chang’s writing from the Mythical thinking, then it is conducted a discussion in terms that it is systematically established in the culture critic text (The XXth Century). This thesis is based on the analysis of 說文解字(Shuowenjiezi), an authoritative text in the study of Chinese Characters. 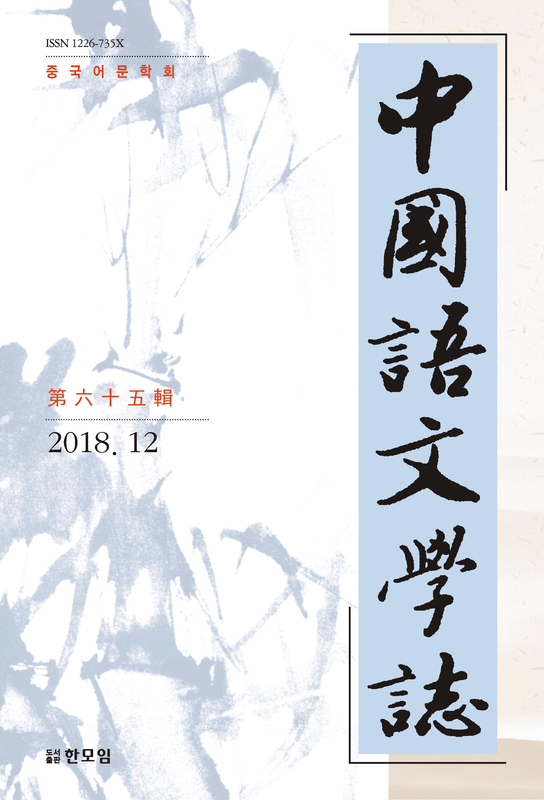 The main objectives of this research are: examining the meaning creation, division and linking processes of Chinese characters through ‘象xiang’; and clarifying the generative principles behind the formation of polysemous characters through a classification method called ‘類lei’. The research is largely composed of three steps. The first is defining the principles that shaped the basic meaning structure of Chinese characters. The second is studying the creation and alternation ofmeaning by looking into examples of character division and compound letters. Lastly, the thesis concludes by further explaining these basic formation principles through the theory of exceptions of basic principles. 대외한어교육과정에서 교학 및 학습 등에 여러 가지 난점이 존재하는데 狀態補語 역시 그 중의 하나다. 게다가 학습자들은 비록 보어의 의미를 알더라도 어느 때 써야하고 어떤 때 쓰면 안 되는지 혼동할 때가 많다. 필자는 현재 어법학계에서는 아직 狀態補語 교수방안에 관한 전면적 연구가 부족하다고 판단하고, 본 논문에서는 교수방안을 통해서 狀態補語의 사용조건을 고찰해 보았다. 狀態補語에 관한 어의 특징과 본질적 기능에 관한 분석을 통해서 비교적전면적인 狀態補語의 사용조건을 고찰해 보았다. 그 결과 이미 발생한 행위의 주체, 대상, 동작에 대해 묘사 혹은 평가하는 것 외에도 아직 발생하지 않은 행위, 만약 기대 혹은 예기한 결과에 대해 묘사나 평가가 필요할 때에도 상태보어를 쓸 수 있다. Measure-word is one characteristic of Chinese and Sino-Tibetan. Its basic syntactic function is to categorize nouns, but some research shows its classification function is very weak in chinese. This paper takes the measure-word JIAN(件) as study subjects in order to discover the principle for the categorization of the measure-words. The paper on the basis of analyzing the etymology and the categorization of measure-word JIAN(件), to find out the reasons on the choice of nominal structures by this measure word. Figure of speech is the special expression format with regularity formed in pronunciation, vocabulary and grammar on the basis of. It is the result of the creation of the expression to improve the expressive effect and an important means to make the language art, and it has a special aesthetic attributes. In the sketch language application, humorous effect of figure of speech should not be underestimated. But until now, the study on the application of figure of speech of sketch is still very weak. This paper, combined with the sketch of CCTV’s Spring Festival evening broadcast on the examples, analysis the characteristics of Hyperbole, Parody, Qushuo, Qiyi in the sketch and their humorous effect in detail and reveals the role of them in the composition of humorous language. It provides some reference for the creation and appreciation of the sketch and factual basis for the theory research and application research of figure of speech.